Enchanting Scales is the story about two twelve year old girls that are in far over their heads. Between their Parents, mages, dragons, and an Emporer it is easy for them to become overwhelmed. Pandora and her cousin, Serene, are in search for a safe place to call home while toting around some interesting companions. Enchanting Scales has not been tagged yet. 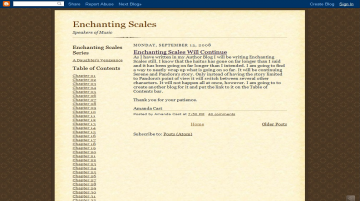 Help others find Enchanting Scales by tagging it! As far as I can see, this novel has nothing to do with musical scales, but rather a more exciting kind: Dragon scales. The point-of-view is generally that of the protagonist, Pandora, but some scenes involve her new-found friend Serene (a half-elf girl). The two come from very different backgrounds, but it is clear from the beginning that the two are well suited to each other. Enchanting Scales has not been recommended yet.